“The Threat of Religious Extremism to Religious Freedom and Security” has been the Commission’s overarching theme during this reporting period, and unfolding events in Pakistan make clear the relevance of this theme to the 2009 Annual Report. At the time of writing, emboldened Taliban-associated extremists had advanced to within 60 miles of the Pakistani capital of Islamabad. In the areas they already control, these groups are imposing draconian restrictions on human rights and religious freedom and engaging in brutal acts against individuals, particularly women and local police, who refused to accede to their repressive policies. The Commission predicted this result in February 2009, as the Pakistani government considered entering into a so-called “peace deal” with these elements in the Swat Valley. On February 25, the Commission publicly warned that the agreement “would represent a significant victory for Talibanassociated extremists fighting in the Swat Valley, and could embolden other violent extremists and Taliban militants who would seek to expand their influence and control elsewhere in Pakistan and Afghanistan”. The Commission’s concerns sadly were borne out when, soon after Pakistan’s Parliament and President approved the deal, the extremists moved to duplicate their success in neighboring regions. While Pakistani leaders have acquiesced to the rule of Taliban-associated extremists in some regions, members of civil society have courageously objected. The front cover of this report features Pakistani women standing up against these violent extremist groups. Their signs, written in Urdu, protest violent religious fanaticism and the systematic destruction of girls’ schools, 150 of which reportedly have been demolished. These brave women are on the frontlines of the battle to preserve human rights, including religious freedom, in their country. Their voices must be amplified. Since its inception, the Commission has strived to place religious freedom at the forefront of the U.S. foreign policy agenda, and the 10th Annual Report is a key component of those efforts. In this reporting period, the Commission engaged both the Bush and Obama Administrations on ways to promote religious freedom and highlighted a number of critical issues to U.S. foreign policy. The Commission also has raised concerns and highlighted a variety of problematic regional and global trends, such as the expansion of highly restrictive religion laws in many countries of the former Soviet Union, the promotion of the pernicious .defamation of religions. concept at the United Nations, and major limitations on religious freedom throughout Asia. Each year the Commission makes recommendations to the President, the Secretary of State, and the Congress, based on its ongoing review of the facts and circumstances of violations of religious freedom, as to which countries should be designated as “countries of particular concern,” or CPCs. 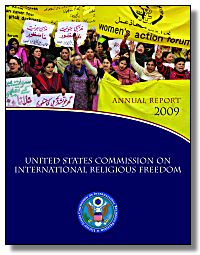 In doing this, the Commission works alongside an array of diplomatic mechanisms also established by the International Religious Freedom Act (IRFA), such as the Office of International Religious Freedom at the Department of State, headed by the Ambassador-at-Large for International Religious Freedom. IRFA mandated that the State Department work through its embassies and consulates abroad to collect information on religious freedom conditions and by September 1 of each year review the status of freedom of religion or belief worldwide. That review comes in the form of the Annual Report on International Religious Freedom. Based on that review, IRFA directs the Secretary of State, delegated by the President, to designate “countries of particular concern,” or CPCs, which are countries whose governments have engaged in or tolerated “particularly severe” violations of religious freedom. IRFA defines “particularly severe” violations as ones that are “systematic, ongoing, and egregious,” including acts such as torture, prolonged detention without charges, disappearances, or “other flagrant denial[s] of the right to life, liberty, or the security of persons”. After a country is designated as a CPC, the president is required by law to oppose the violations by taking actions specified in IRFA. In this reporting period, the Commission recommends that the Secretary of State designate the following 13 countries as CPCs: Burma, the Democratic People’s Republic of Korea (North Korea), Eritrea, Iran, Iraq, Nigeria, Pakistan, the People’s Republic of China, Saudi Arabia, Sudan, Turkmenistan, Uzbekistan, and Vietnam. Serious religious freedom concerns persist in Pakistan, due to continuing sectarian and religiously-motivated violence and the government’s inadequate response. The past year has seen the largely unchecked growth in the power and reach of extremist groups whose members are engaged in religiouslymotivated violence in Pakistan and abroad. A number of the country’s laws abridge freedom of religion or belief. Anti-Ahmadi legislation results in discrimination against individual Ahmadis and effectively criminalizes various practices of their faith. Anti-blasphemy laws have been used to silence members of religious minorities and dissenters, and frequently result in imprisonment on account of religion or belief and/or vigilante violence. The Hudood Ordinances—Islamic decrees predominantly affecting women that are enforced alongside Pakistan’s secular legal system—provide for harsh punishments for alleged violations of Islamic law. Extremists have imposed a harsh, Talibanstyle rule in the Swat Valley and neighboring districts, with the acquiescence of provincial and Federal government authorities. The government of Pakistan also continues to promote the flawed.defamation of religions. concept at the United Nations, which would violate the freedoms of religion and expression. The Commission held a series of hearings during the reporting period, many of which explored religious extremism and U.S. national security interests. Two hearings focused on the impact of religious extremism on religious freedom and security in Bangladesh and Pakistan, respectively, while the other discussed the peace process in Sudan and the implementation of the Comprehensive Peace Agreement. 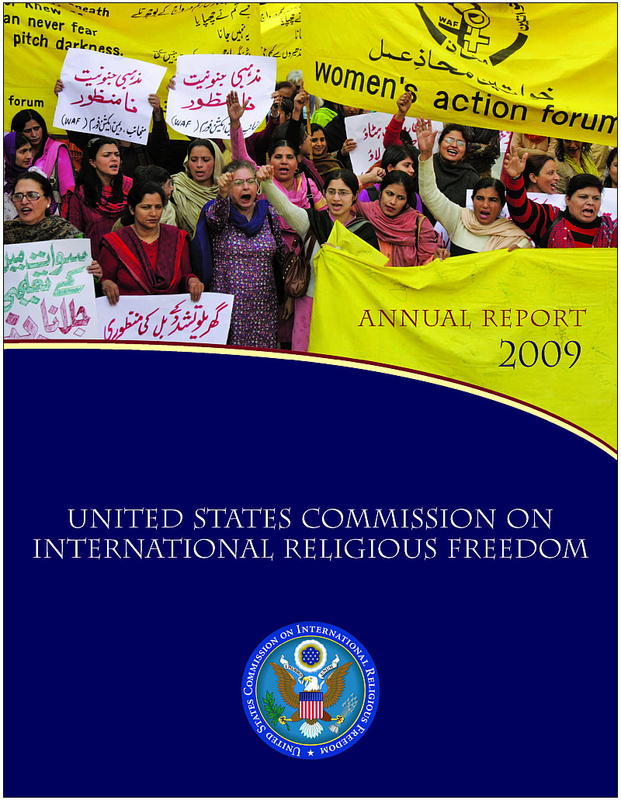 In March 2009, the Commission convened a hearing to discuss Pakistan and the threat posed by religious extremism to religious freedom and related human rights, particularly for women, members of religious minorities, and other vulnerable communities. Entitled Pakistan: The Threat of Religious Extremism to Religious Freedom and Security, Commissioners heard testimony from five witnesses who discussed limitations on religious freedom and violence against women and religious minorities, including Shi’a Muslims, Ahmadis, Christians, and Hindus, as well as the extremist threat to democratic institutions and the rule of law and Pakistan’s relationship with Taliban-associated religious extremists. Witnesses included the former U.S. ambassador to Pakistan, William Milam, and Pulitzer Prize-winning journalist Steve Coll. Representative Sheila Jackson Lee (D-TX) participated and provided opening remarks. Dramatic political events unfolded in Pakistan in the past year, some of them with a potentially significant impact on the rule of law and human rights protections generally, including freedom of religion or belief. This year also has seen the largely unchecked growth in the power and reach of religiously-motivated extremist groups whose members are engaged in violence in Pakistan and abroad, with Pakistani authorities ceding effective control to armed insurgents espousing a radical Islamist ideology. In addition, all of the serious religious freedom concerns on which the Commission has reported in the past persist. Sectarian and religiously-motivated violence continues, particularly against Shi’a Muslims, Ahmadis, Christians, and Hindus, and the government’s response continues to be insufficient, and in some cases, is outright complicit. A number of the country’s laws, including those restricting the rights of Ahmadis and criminalizing blasphemy, frequently result in imprisonment on account of religion or belief and/or vigilante violence against the accused. Moreover, despite some minor improvements, Pakistan’s Hudood Ordinances, Islamic decrees introduced in 1979 and enforced alongside the country’s secular legal system, provide for harsh punishments, including amputation and death by stoning, for violations of Islamic law. Pakistan also has taken a leadership role in promoting in various international fora the concept of “defamation of religions,” an attempted globalization of its own blasphemy laws, which this Commission believes would limit seriously and criminalize the rights to freedom of religion and expression of individuals worldwide.… In light of these persistent, serious concerns, the Commission continues to recommend that Pakistan be designated a “country of particular concern,” or CPC. To date, the State Department has not designated Pakistan a CPC. The Zardari government has taken some positive steps regarding religious freedom. In November 2008, the government appointed prominent minority-rights advocate Shahbaz Bhatti as Federal Minister for Minorities with cabinet rank. Mr. Bhatti has publicly promised that the Zardari government will review Pakistan's blasphemy laws and that the government is committed to protecting the rights of minority religious communities, including by implementing a five percent quota for religious minorities in federal government employment. In March 2009, the government appointed a Christian jurist as a judge in the Lahore High Court. It is not yet clear what impact these developments will have on religious freedom, which has been severely violated by successive Pakistani governments in the past. Discriminatory legislation, promulgated in previous decades and persistently enforced, has fostered an atmosphere of religious intolerance and eroded the social and legal status of members of religious minorities, including Shi’a Muslims, Ahmadis, Hindus, and Christians. Government officials do not provide adequate protections from societal violence to members of these religious minority communities, and perpetrators of attacks on minorities seldom are brought to justice. This is partly due to the fact that Pakistan’s democratic institutions, particularly the judiciary and the police, are weakened by endemic corruption, ineffectiveness, and a general lack of accountability. Many religious schools, or madrassas, in Pakistan provide ongoing ideological training and motivation to those who take part in violence targeting religious minorities in Pakistan and abroad. In mid-2005, the government of Pakistan renewed its effort to require all madrassas to register with the government and ordered them to expel all foreign students. By that year’s end, despite an outcry from some violent extremist groups, most of the religious schools had registered. However, reports indicate that the registration process has had little if any effect on the content of the schools’ curricula, which remains extremist and includes exhortations to violence, and there are still no government controls on the madrassas’ sources of funding. It remains doubtful whether these belated official efforts to curb extremism through reform of the country’s Islamic religious schools will be accompanied by other measures to make them effective. Moreover, these efforts do not adequately address the much wider problem of religious extremism in Pakistan and the continued, unwarranted influence of militant groups on the rights and freedoms of others. Ahmadis, Christians, and Hindus also have been targeted in attacks by Sunni extremists and in mob violence conducted with apparent impunity. In September 2008, the Pakistani television network Geo TV broadcast a religious affairs program about the Pakistani parliament’s 1974 decision to declare Ahmadis “non-Muslim.” The host of the program reportedly encouraged his guests, who were religious scholars, not only to endorse this decision but to affirm the duty of killing Ahmadis. A day later, a prominent Ahmadi doctor was assassinated, and a local Ahmadi leader was killed the following day. Perpetrators of such attacks on minorities are seldom brought to justice. Indeed, according to the State Department, the government stalled investigation of these two murders. Among Pakistan’s religious minorities, Ahmadis are subject to the most severe legal restrictions and officially-sanctioned discrimination. Ahmadis, who number between 3 and 4 million in Pakistan, are prevented by law from engaging in the full practice of their faith and may face criminal charges for a range of religious practices, including the use of religious terminology. Pakistan’s constitution declares members of the Ahmadi religious community to be “non-Muslims,” despite their insistence to the contrary. Barred by law from “posing” as Muslims, Ahmadis may not call their places of worship “mosques,” worship in non-Ahmadi mosques or public prayer rooms which are otherwise open to all Muslims, perform the Muslim call to prayer, use the traditional Islamic greeting in public, publicly quote from the Koran, or display the basic affirmation of the Muslim faith. It is also illegal for Ahmadis to preach in public; to seek converts; or to produce, publish, or disseminate their religious materials. Over two days in late May 2008, the inhabitants of the majority-Ahmadi town of Rabwah, Punjab (called Chenab Nagar by Pakistani authorities) celebrated their faith through distinctive clothing, badges with religious slogans, lighting displays, and fireworks. Two weeks later, police lodged charges against the entire community under the anti-Ahmadi laws. In a separate incident in June 2008, 23 Ahmadis were expelled from medical school in Faisalabad, Punjab for allegedly preaching their faith to others. Moreover, because they are required to register to vote as non-Muslims, Ahmadis who refuse to disavow their claim to being Muslims are effectively disenfranchised. The one potentially positive development—the December 2004 abolition of the religious identification column in Pakistani passports, which, among other advances, enabled Ahmadis to participate in the hajj—was derailed in March 2005, when members of a government ministerial committee restored the column, reportedly in response to pressure from Islamist religious parties. As far as is known, there has never been an effort on the part of any Pakistani government to reform the anti-Ahmadi laws. Prescribed criminal penalties for what is deemed to be blasphemy include life imprisonment and the death penalty. Blasphemy allegations, which are often false, result in the lengthy detention of, and sometimes violence against, Ahmadis, Christians, Hindus, and members of other religious minorities, as well as Muslims. Because the laws require no evidence to be presented after allegations are made and no proof of intent, and contain no penalty for leveling false allegations, they are commonly used by extremists to intimidate members of religious minorities and others with whom they disagree. They also are often used by the unscrupulous simply to carry out a vendetta or gain an advantage over another. Although the penalties were amended in October 2004 with the aim of reducing the more maliciously applied charges, the minor procedural changes have not had a significant effect on the way the blasphemy laws are exploited in Pakistan. The negative impact of the blasphemy laws is further compounded by the lack of due process involved in these proceedings. In addition, during blasphemy trials, Islamic militants often pack the courtroom and make public threats of violence as a consequence of an acquittal. Such threats have proven credible since they have sometimes been followed by violence. Although no one has yet been executed by the state under the blasphemy laws, individuals have been sentenced to death. Several of those accused under the blasphemy laws have been attacked, even killed, by violent extremists, including while in police custody. Those who escape official punishment or attacks by extremists are sometimes forced to flee the country. Scores of arrests on blasphemy charges are reported each year and most of the accused are refused bail because of the danger of mob violence. In one case, five Ahmadi teenagers were arrested in January 2009 for allegedly writing the Prophet Mohammed's name on the walls of a toilet in a Sunni mosque. The arrest reportedly occurred when they voluntarily appeared before the police to deny the allegation. A fact-finding mission by the Human Rights Commission of Pakistan concluded that there was no witness to the deed and no evidence linking the accused with the alleged action. In January 2009, five Christians, held on blasphemy charges since April 2007, were acquitted and released from custody in Punjab following reconciliation meetings between Muslim clerics and Christian representatives. Another two Christians, both elderly men from Faisalabad, Punjab, were acquitted by the Lahore High Court in April 2009. In November 2006, the two had been sentenced to 10 years in prison for allegedly burning pages from the Koran, a charge reportedly fabricated due to a land dispute. Although there have been occasional acquittals on blasphemy charges, in virtually all cases those acquitted have been forced into hiding or even exile, out of fear of attacks by religiously-motivated extremists. The government of Pakistan also has been active in the international arena in promoting limitations on freedom of religion or belief. As it has done in UN bodies since 1999, in March 2009 Pakistan once again presented a resolution to the UN Human Rights Council in Geneva supporting measures to halt the so-called “defamation of religions”. The backers of the resolution claim that their aim is to promote religious tolerance, but in practice such laws routinely criminalize and prosecute what is often deemed—capriciously by local officials in countries where such laws exist—to be “offensive” or “unacceptable” speech about a particular, favored religion or sect. Defamation of religion laws clearly violate principles outlined in international human rights instruments, which guarantee the right to freedom of expression, as well as freedom of thought, conscience, and religion. Moreover, they appear to grant rights to entire religions rather than to individuals. Regrettably, the resolution passed the Council with 23 votes. Eleven countries voted against the resolution and 13 countries abstained. The Commission has long been concerned with the serious religious freedom abuses that are perpetuated in Pakistan, some of which are condoned by the government of Pakistan itself. Since 2002, the Commission has recommended each year that Pakistan be designated a country of particular concern. The Commission has highlighted religious freedom problems in Pakistan through public hearings, meetings with the Administration and the Congress, letters to senior U.S. government officials, and press statements. In February and April 2009, the Commission called attention to the willingness of Pakistan’s provincial and central governments to accept an agreement conceding local control of the Malakand division, of which the Swat Valley is a part, to Taliban-associated extremists who routinely use violence to enforce their political and theological agendas, resulting in systematic human rights abuses and severe limitations on religious freedom. In March 2009, the Commission held a hearing on Capitol Hill entitled, “Pakistan: The Threat of Religious Extremism to Religious Freedom and Security”. Experts discussed legal restrictions on religious freedom in Pakistan; the threat, particularly to women and religious minorities, of religiously motivated violence and intolerance; strategies for promoting tolerance in Pakistan's educational system, including Islamic schools; and how U.S. policy toward Pakistan could better support the institutions that promote respect for human rights, including freedom of religion or belief. Based on that hearing and the Commission’s earlier work on Pakistan, the Commission welcomes the Administration’s announcement on March 27, 2009 of “a comprehensive, new strategy” that “focuses more intensively on Pakistan than in the past, calling for more significant increases in U.S. and international support, both economic and military, linked to Pakistani performance against terror.” The Commission concludes strongly, however, that the contest with religious extremists now taking place in Pakistan, and neighboring Afghanistan, requires, in addition to economic and military assistance, that the United States bolster the position of those elements within Pakistani society that respect democratic values, the rule of law, and international standards of human rights, including freedom of religion or belief. To this end, the Commission has made a number of recommendations, the most recent of which appear below. In addition to recommending that Pakistan be designated a CPC, the Commission has the following recommendations for the U.S. government regarding Pakistan. constituting a government commission that is transparent, adequately funded, inclusive of women and minorities, and defined by a mandate to study and produce recommendations on ways that the Pakistani government can proactively diminish religiously-motivated and sectarian violence, particularly in areas with a heavy concentration of members of religious minority communities, such as Shi’a Muslims in Kurram Agency. halt its practice at the UN Human Rights Council and other international fora of introducing the socalled.defamation of religions. resolution, which violates the internationally-guaranteed rights to freedom of religion and expression. designate a member of Special Representative to Afghanistan and Pakistan Richard Holbrooke’s team to report to the Special Representative exclusively on human rights in Pakistan, specifically including religious freedom and sectarian violence. reinforce the rule of law, including by strengthening protections for the freedoms of religion, speech, association, assembly, and the media, and by restoring and resolutely defending an independent judiciary. recognizing that lasting stability in Pakistan will come from a vibrant civil society, expand programs leading to the sustained engagement of the United States with the Pakistani people, such as the Fulbright Program, the International Visitor Program, and other exchanges for professionals, students, and religious and civil society leaders from all of Pakistan’s diverse communities. confront and work to address the consequences of the political alliances maintained by past military-dominated governments with Islamist political parties, which afforded an excessive amount of influence to these groups, and which, in turn, had a strong negative impact on religious freedom in Pakistan. set detailed, transparent, and measurable benchmarks for the use of civilian and military assistance to ensure, inter alia, that U.S. aid does not bolster Taliban-associated or other violent extremist groups; serves as a confidence-building measure that can help restore the trust of the Pakistani people in the United States and its commitment to Pakistan’s security, stability and prosperity; and promotes consistency in how aid is disbursed and goals are pursued. ensure that a madrassa oversight board is empowered to develop, implement, and train teachers in human rights standards, and to provide oversight of madrassa curricula and teaching standards. request an annual progress report from the U.S. State Department and/or the U.S. Agency for International Development to Congress and the U.S. Commission on International Religious Freedom regarding U.S. education assistance to diminish intolerance in Pakistan’s state schools and madrassas, and progress made toward detailed, transparent, and measurable benchmarks.